How do I delete messages, conversations or photos in Messenger? HomephotosHow do I delete messages, conversations or photos in Messenger? 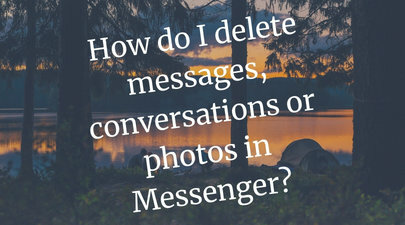 Let's get started with "how do I delete messages, conversations or photos in Messenger?" Recently, a friend of mine asked me the question that makes the title of this article. To proffer a well-documented answer, I've chosen to compile this article. So if you're looking for the step-by-step guides on how to delete a conversation, messages, or photos on Facebook Messenger, this post got you covered. You can delete messages, conversations, and photos from your inbox on Messenger. However, you have to note that deleting messages, conversations as well as photos from your inbox, won't delete them from your friend's inbox. It's pertinent to also bear in mind that it isn't possible to delete sent or received messages from a friend's inbox. So this Belmadeng.com tutorial will only show you how you can delete stuff from your own Messenger inbox. Before you should proceed with the below steps on how to delete stuff in Messenger, note that you can't delete all your conversations at once, but you can delete individual conversations. 2. Tap and hold the message or photo you'd like to delete until a menu at the bottom pops up. 3. Tap Delete > Delete at the bottom. 1. View your conversations from Home. 2. Press and hold the conversation you want to delete. 3. Tap Delete Conversation > Delete Conversation. 1. View your conversations in the Home tab. 3. Tap Delete > Delete Conversation.